This is Paul's third trip to the UK to see us (he's also slipped one in between, but that's another story) and in one respect the most ill-prepared. Although we have a vague list of options, we don't have anything resembling an itinerary or a plan. Except we knew we wanted to spend a few days in Wales this time around, and having kept an eye on the weather, this weekend looked the best bet. In a strange echo of a recent news story about a man almost following his sat-nav directions off the edge of a cliff, we programmed the device for Aberdovey and were only halfway there when it announced "you have reached your destination." So much for technology. We ended up taking the coast road we had intended to enjoy tomorrow, and fetched up in Aberdovey mid-afternoon after a short detour to take in the delights of Oswestry. 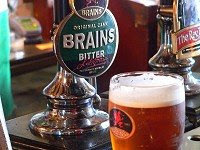 Before long we were tucked away in the bar of the small but perfectly formed Dovey Hotel, enjoying the first of many pints of Brains. In some strange way a perfect alternative to our usual pints of Boddies. After the light refreshment and having checked in and checked out the rooms which were also small but perfectly formed, we decided to take advantage of the remaining light and amble around the town for a while to see the sights. I don't know what it is about travelling with Paul, but we always seem to come across unusual signs. Last year it was the Gunt. This time we found Pusi. What can I say? This wasn't the only "enhanced" sign we saw during this three-day jaunt to Wales. It seems to have become something of a sport in the area, to perform amusing alterations. After watching some outward bounders chucking themselves off the pier, and climbing up and around the backstreets of Aberdovey for an hour or so, we returned in time to take pole position in the sports bar to watch the Six Nations match between Wales and Ireland. I wouldn't normally be interested in the rugby, but you can't beat the atmosphere watching a national team in a national pub, and it was actually a cracking game, during which we consumed an evening meal and several pints. The day was finished off with a swift game of pool before we retired to spend the night in what must be the most uncomfortable beds any of us had ever slept in. You did stay away from Brains SA, didn't you? I told you about my experience with that stuff. All I saw of Wales was Cardiff, but I had a good couple of days there. A tour of the castle is good fun. We were going to start in the South and work our way North but decided there was too much to see in the few days we had available, so we've saved the South for another year.